A pasta joint is only as good as its meatball recipe. I want them as an appetizer because it helps me manage my expectations for the rest of the meal. Okay, that’s a bit of a lie. Ordering those savory spheres is the act of a desperate, insecure man. 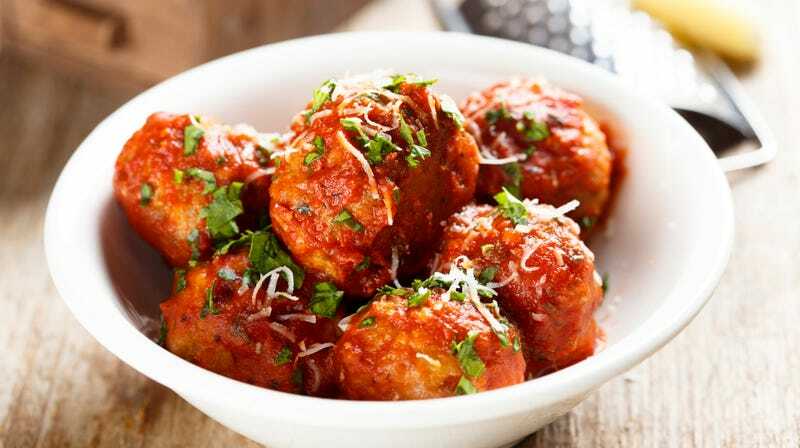 I want the meatballs to be good, of course. But I don’t want them to be better than the ones I make. Not too long ago, I wrote about the Sunday Sauce I cobbled together from various family recipes, and dropped a reference to the meatball I came up with. Well, here it is. I like to think of my meatball recipe as a never-ending work-in-progress, borrowing elements from family traditions, as well as a few well-regarded restaurants. One of the first places I looked for inspiration was the Brooklyn eatery Frankies 457 Spuntino. My friends got married there—five days after I turned my back on vegetarianism for good—and the groom asked the kitchen for a plate of the restaurant’s famous meatballs. I tried a bite and fell in love with their consistency. At that point, the last meatballs I’d had were my mom’s more than 20 years prior, and I remembered them being a lot denser, almost bouncy. These were decidedly looser, but they still held together. Lucky for me, I was in the wedding party and all of the groomsmen received copies of the restaurant’s cookbook (as well as gargantuan cans of its branded olive oil). Of course, when I opened the book I was horrified. The recipe called for—get ready for this—raisins! No thank you. But there are some key elements of the Frankies’ method that have become permanent components of my recipe—particularly the ratio of bread, breadcrumbs, and eggs to achieve the ideal consistency. In my early batches, I also incorporated the pine nuts that the Frankies’ recipe calls for, but determined that the meatballs were better off without them. Their flavor can be a bit too pronounced, in a manner that overshadows and clashes with the other ingredients. Besides, after much tweaking, I discovered that crushed walnuts are the perfect addition. I know, it sounds weird, but trust me on this. Speaking of controversial ingredients, I’m a fan of chopped onions. My mother refuses to add them to her recipe because, and I quote, “I put onions in my meatloaf.” Mom logic. It’s odd because the few pleasant memories from the times my mother would unload me on her parents when I was four or five years revolved around my grandmother’s Sunday sauce and the tasty chunks of onion poking out of her meatballs. Finally, I’d be remiss if I didn’t mention the meatballs’ … well, meat. I use a 50-50 beef-and-pork combo. I’ve done an all-beef version, but it just doesn’t do it for me. Feel free to try it both ways and decide whether or not I’m right. Preheat oven to 350 degrees Fahrenheit. Put the bread into a pot or bowl and pour water over it until all the pieces are covered, then let it sit for 30-60 seconds. Dump it out into a colander and ring out the excess moisture, tearing the wet bread into even smaller pieces. Place in a large bowl. Add the ground beef and pork to the bread, mixing thoroughly by hand. Add the garlic, parsley, and onion and mix again. Add four of the eggs and knead the mixture further. Add the pecorino, salt, pepper, and about a third of the panko. Knead that mixture. Add the remaining eggs, another third of the panko and the walnut pieces. Continue to knead, shaking in the remaining panko and ensure the mixture doesn’t get too dry. Rub or spray two baking sheets with olive oil. Shape the meat mixture into racquetball- or tennis-ball-size spheres. Arrange in rows of three on the baking sheets. Remove trays from oven and cool. If you’re making Sunday sauce concurrently, put four to eight of the meatballs in the sauce (depending on the number of guests you’re serving) and put the rest into freezer bags. Making meatballs takes a huge chunk out of your day, so you don’t want to have to make them from scratch every time you make Sunday sauce.